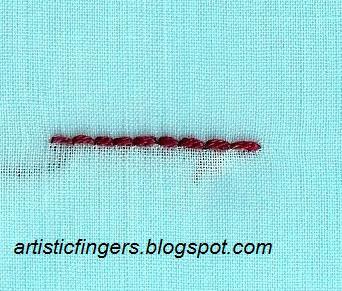 Today let’s learn whipped back stitch, detached chain variation and roman stitch. 1. 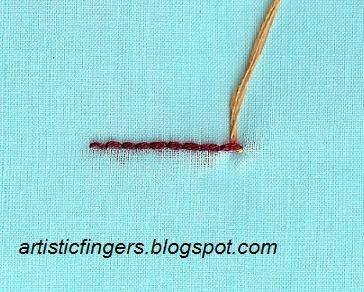 The line which is marked as ‘P1’ in the design (refer stitch guide) has to be completed with whipped back stitch. 2. 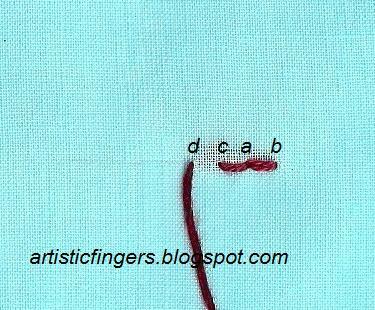 The small circles and a small tear drop shape which are marked as ‘C ‘in the design (refer stitch guide) has to be completed with detached chain stitch variation. 3. 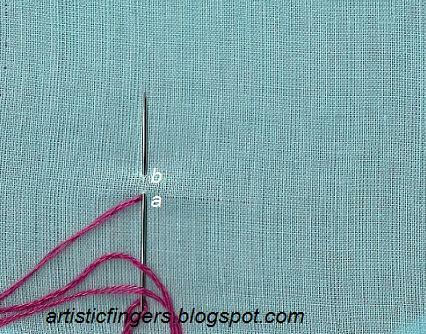 The lines which are marked as ‘B’ (refer stitch guide) has to be completed with roman stitch. 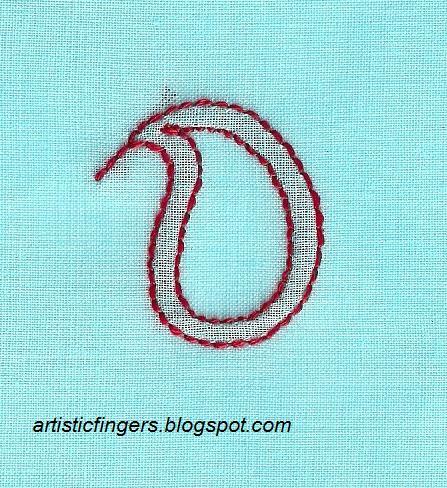 To practice this stitch trace the design no. 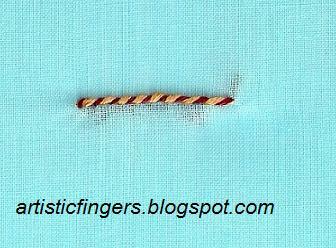 5 from the practice designs onto your doodle cloth and follow the instructions below and stitch. 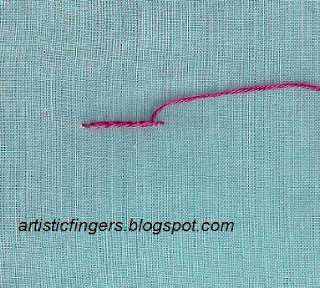 NOTE: I’VE USED A SECOND COLOUR THREAD JUST TO SHOW THE WHIPPING PART CLEARLY.DO NOT USE A SECOND COLOUR THREAD IN YOUR PROJECT.USE THE SAME COLOUR AND SAME NO. 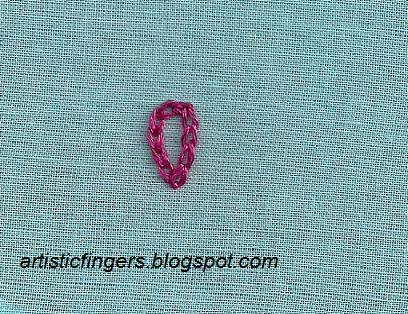 OF STRANDS FOR BOTH BACK STITCH AND WHIPPING . 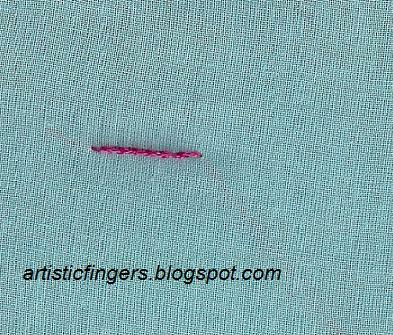 Step 1: Work back stitch first. 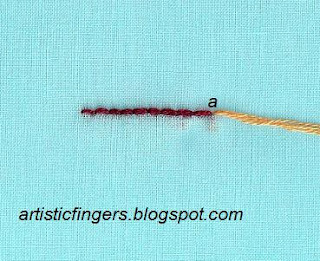 Bring the needle and thread up at ‘a’ as shown. Step 4: Pass the needle under the next stitch as shown in the image above. 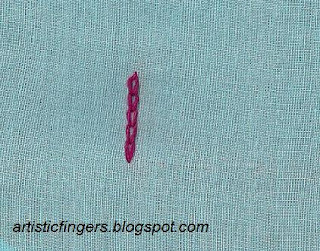 Repeat steps 4 and 5 until you finish the design. 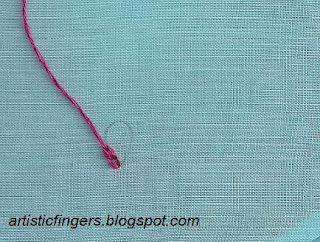 Go back down and end the thread. Complete the line which is marked as ‘P1’ in the design (refer stitch guide) with whipped back stitch. 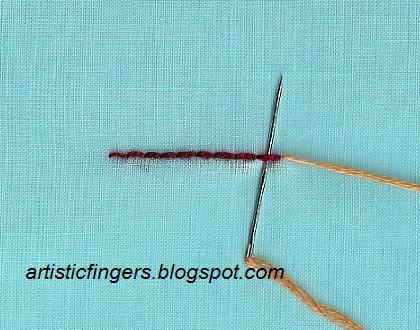 To practice this stitch trace the design no. 13 from the practice designs onto your doodle cloth and follow the instructions below and stitch. 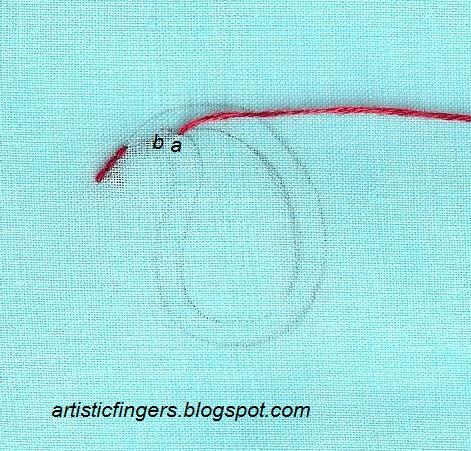 Step 2: Make a chain stitch. 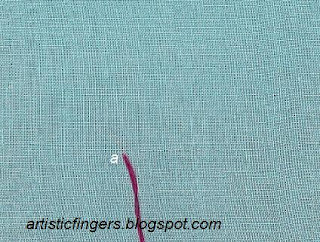 Step 3: Go back down and come up again at ‘a’. 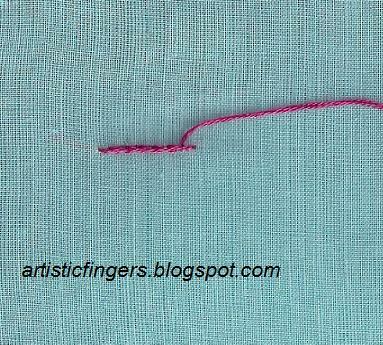 Step 4: Make another chain stitch on top of the first chain made. 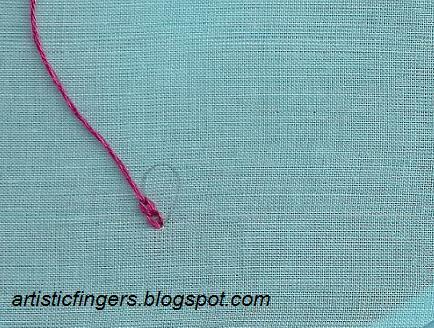 Step 5: Go back down and end the thread. NOTE: Go down for the second stitch into the same point as first one or little closer to the end point of the first stitch if your fabric is thin. Complete the small circles and a small tear drop shape which are marked as ‘C ‘in the design (refer stitch guide) with detached chain stitch variation. Step 1: Bring the needle and thread up at ‘a’. 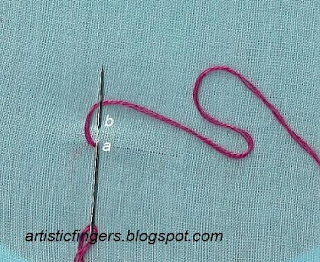 Go down at ‘b’, forming a straight stitch. 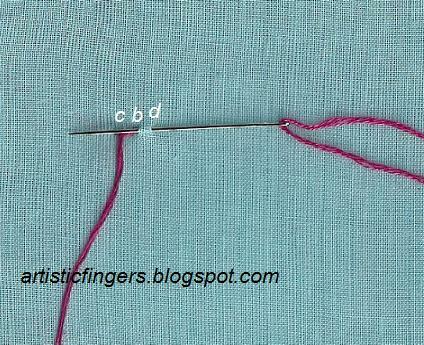 Step 2: Bring the needle and thread up again at ‘c’. 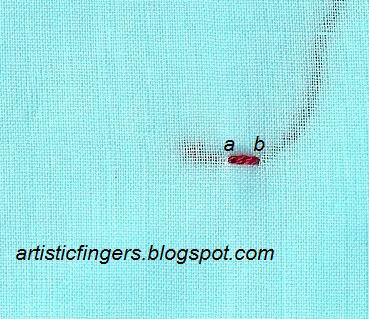 Step 3: Go back down at ‘d’, forming a cross stitch above the straight stitch made in step 1. This is the method of working roman stitch in surface embroidery. In Chikan embroidery, both the above method of working roman stitch and also another method where angle of the cross stitch changes (which is shown below) are used.You can follow either the above method or the one shown below to work roman stitch in your project. 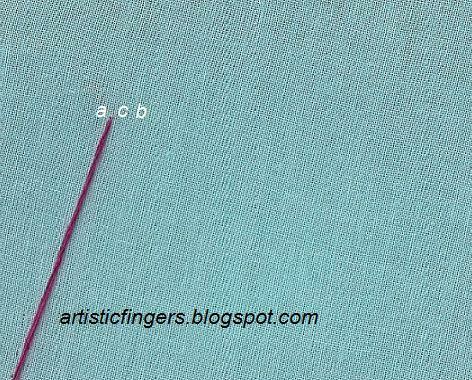 Complete the lines which are marked as ‘B’in the design (refer stitch guide) with roman stitch. 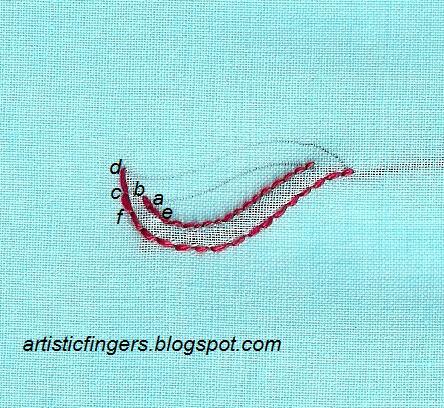 Trace the design no.8 from the practice designs onto your doodle cloth and complete it with roman stitch. 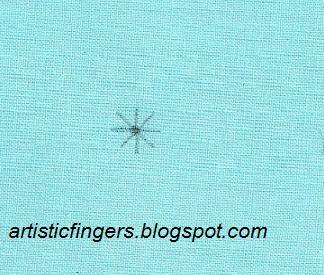 This is used as an all-over motif in chikan blouses. 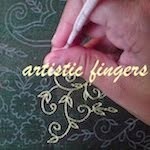 I noticed that a couple of participants have some doubts and are finding lesson 3 little difficult. 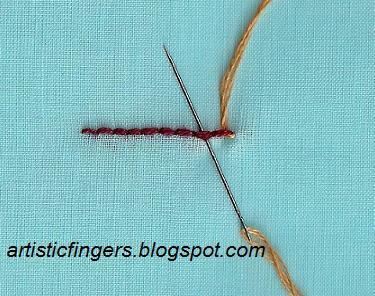 So here are some tips to those who find a lesson difficult when more than 2 stitches or elements are dealt with. Read the full instructions carefully first. 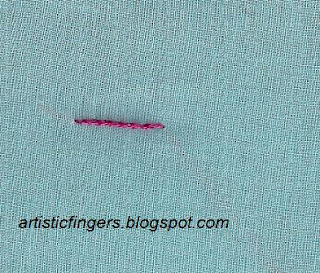 Next step is to proceed with one stitch or one element/shape at a time, read the instructions for first stitch/element carefully ,try to understand how it’s stitched and then make a note of where that stitch has to be worked which I’m writing at the end of that particular stitch instructions in bold letters always . 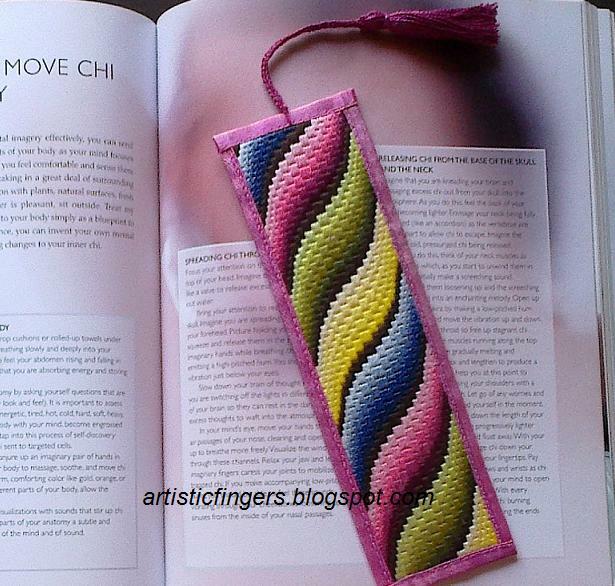 Complete that first part in your design and go to the next part of the lesson, read the instructions and complete that element in your design…This is what I do and hope this helps. 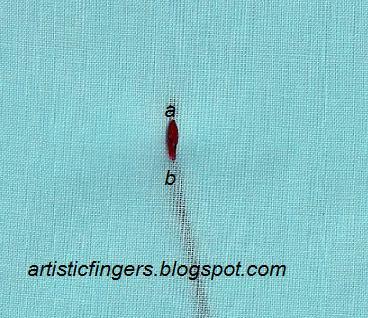 If you have any doubts e-mail me at artisticfingers2012@gmail.com. I’d like to show y’all a bargello bookmark today. It’s for my mom’. Let’s learn back stitch today and also complete some elements of the design with double back stitch. To practice this stitch trace design no. 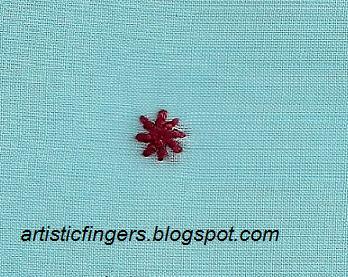 3 from the practice designs onto your doodle cloth and follow the instructions below to stitch. Step 1: Bring up the needle and thread at ‘a’. Step 4: Go back down at ‘a’. 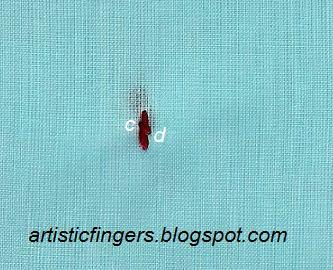 Step 5: Come up at ‘d’and go back down at 'c'. Continue like this and complete the line. 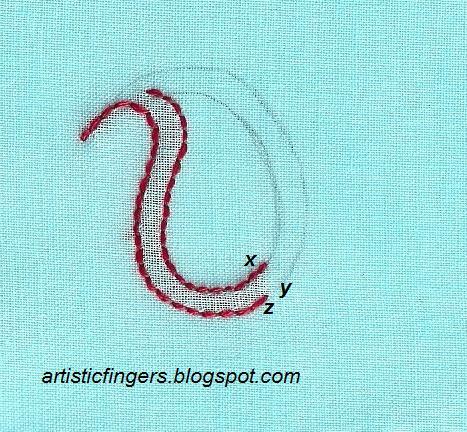 Trace design 4c from the practice designs onto your doodle cloth and follow the instructions below. Bring up the needle and thread at ‘a’ , go back down at ‘b’ , come up at ‘c’ , go back down at ‘d’ , come up at ‘e’, go back down at ‘a’ ,come up at ‘f’ , go back at ‘c’ and continue like this to complete this heart. 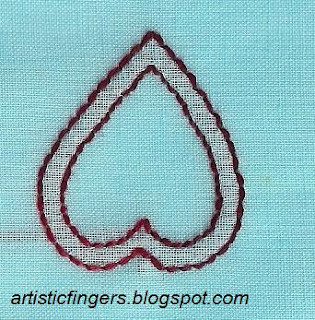 Complete the heart shape which is marked as ‘H1’ in the design (refer stitch guide). Trace design 4d from the practice designs onto your doodle cloth and follow the instructions below. Complete the extension of the paisley tip with back stitch, bring the needle and thread up at ‘a’, go back down at ‘b’ and continue working double back stitch. We may run out of working thread in the middle. 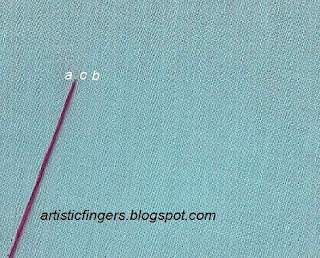 So I’d like to show you where to start again. 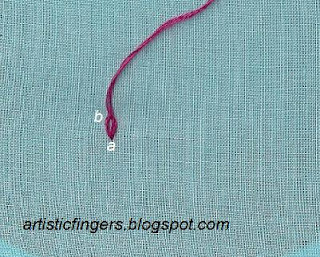 I’ve ended the working thread at ‘X’ in the above image. To start a new thread normally we come up at the point where we’d ended. But in double back stitch we should think about where we’d have come up if we have not ended the working thread and that is your starting point. 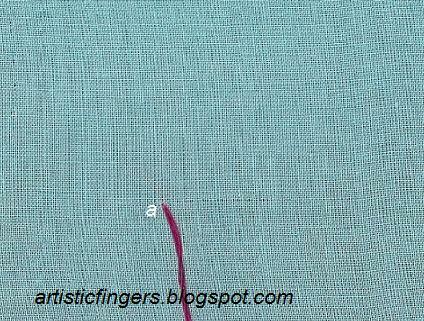 Here ‘y’ is the starting point and I’ve to go back down at ‘z’ and continue to stitch. 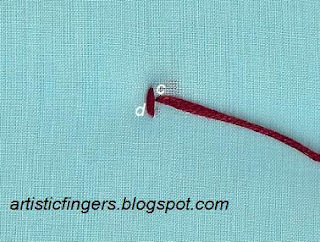 Complete the line which is marked as 'P' with back stitch ,do not cut the working thread and continue with paisley which is marked as ‘H2’ in the design (refer stitch guide) . Trace design 4b from the practice designs onto your doodle cloth and follow the instructions below. 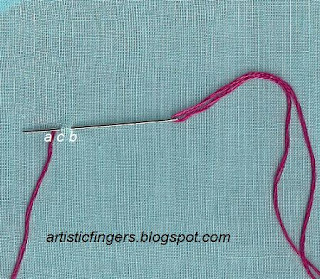 Bring up the needle and thread at ‘a’ , go back down at ‘b’ , come up at ‘c’ , go back down at ‘d’ , come up at ‘e’, go back down at ‘a’ ,come up at ‘f’ , go back at ‘c’ and continue like this to complete this leaf. 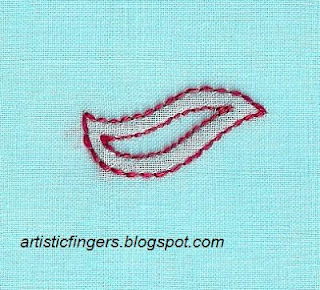 Complete the small stems which is marked as 'P' with back stitch and the leaf which is marked as ‘H’ in the design with double back stitch (refer stitch guide). 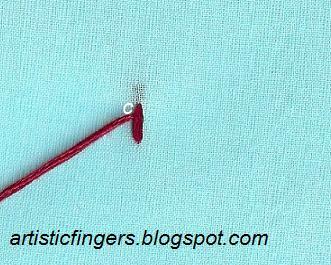 Did you notice that the starting point is in the inner line for all the 3 shapes? 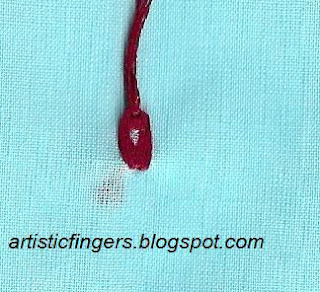 If not the please make a note of this tip. 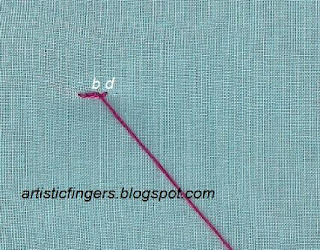 NOTE : When we work double back stitch in any of the shapes above other than the tear-drop we should adjust the length of the stitches slightly to get it right. 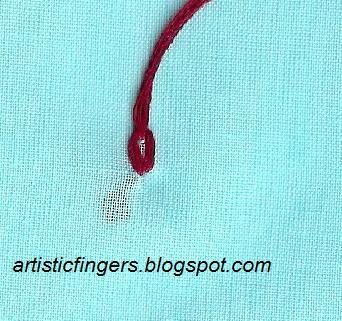 Remember this – the length of the stitches in the inner line should be smaller than the stitches in the outer line. Lots of stitching to be done this week, so our lesson 4 is easy and area to be stitched will be very little so that you girls will have 2 weeks to complete lesson 3 and 4. Is it o.k? If you need more time please let me know so that I can post an easy lesson 5 too. I’m so happy to see all the chikan embroidery projects. You girls have made my day. Thank you all. My mom’ (my embroidery teacher too) was so happy to see your work and wanted me to convey her wishes to you all. There are 135 participants from 17 countries in our SAL. I can hear you girls asking me, so what’s the good news? 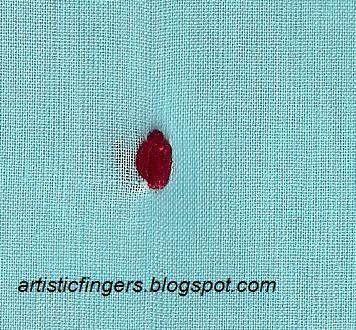 Since I am a new blogger I didn’t expect this response. I get request e-mails still and due to my lack of time I couldn’t accept.I don't want to disappoint so many friends and I thought I'll run this class again after April.When my mom’ asked me about this class today I told her about my problem and she has offered to help me with this for the next couple of weekends. 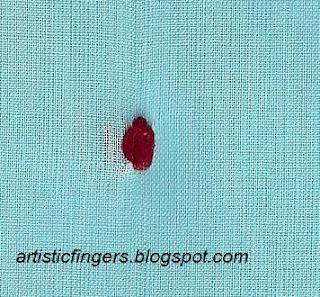 She believes in sharing, she had learnt her craft that way because there was no formal craft classes in India 40-50 years back. HURRAY! 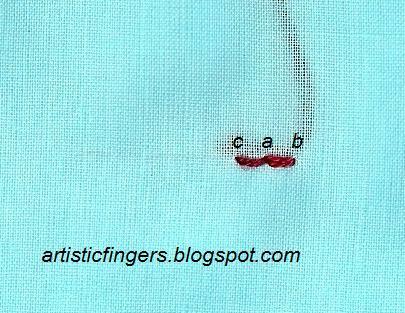 Now my mom’ is on board and she will send the design and instructions to those who wants to join us. All you have to do is to send me an e-mail to register in this class, please do mention your country name in your e-mail. 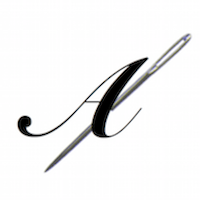 Please do not leave your e-mail id in the comments form. 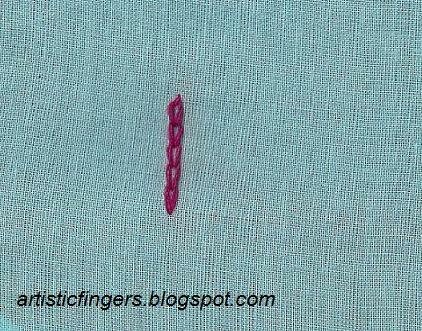 Today let’s learn stem stitch and chain stitch. I’m sure many of you know how to work these stitches. 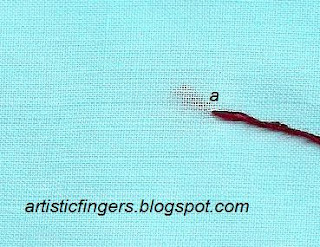 But there are few beginners too. 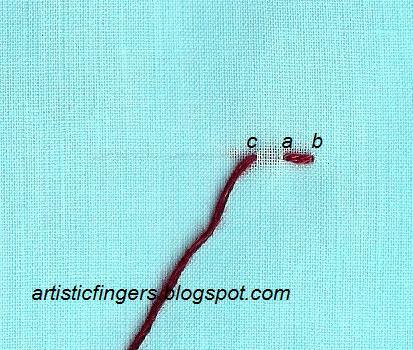 So I’m posting some how-to images for them. 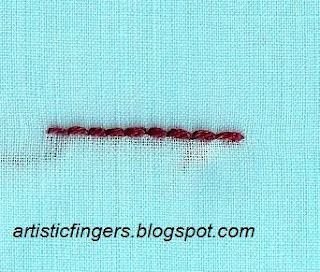 If you know these stitches then go ahead and finish the line which is marked as 'F' with stem stitch and ‘E’ with chain stitch (refer stitch guide). 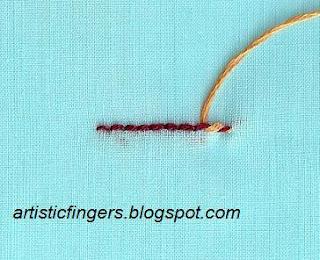 If you are a beginner, to practice this stitch trace design ‘2’ from the practice designs onto your doodle cloth, follow the instructions given below and stitch. 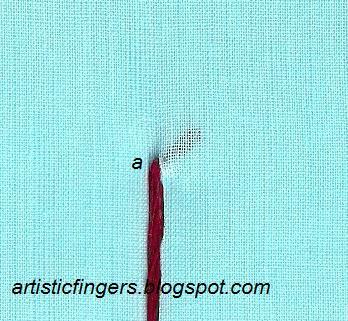 Step 1 - Bring the needle and thread up at ‘a’. 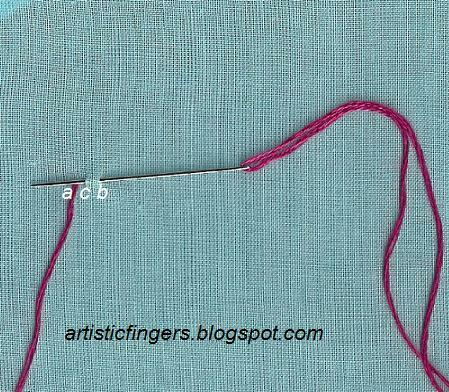 Step 2 - Keeping the thread below the line, go back down at ‘b’ and come up at ‘c’ as shown in the image above. 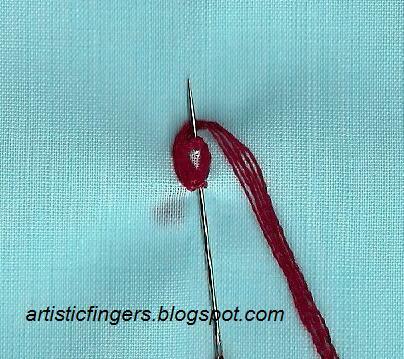 Step 3 - Pull the needle and thread. 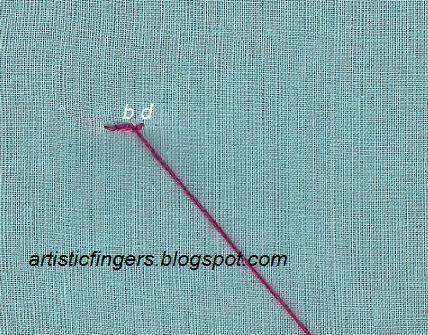 Step 4 - Keeping the thread below the line, go back down at ‘d’ and come up at ‘b’ as shown. 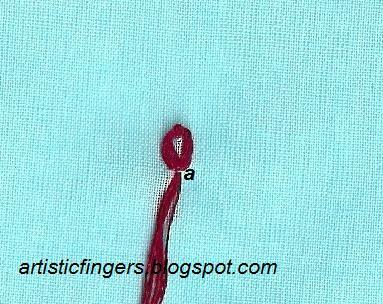 Continue in this manner till you complete the line and finish it as shown above. 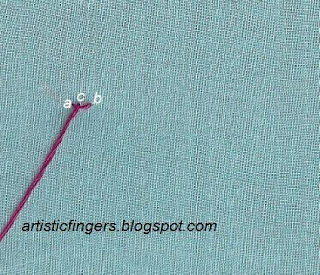 If you are a beginner, to practice this stitch trace design ‘1’ from the practice designs onto your doodle cloth, follow the instruction below and stitch. 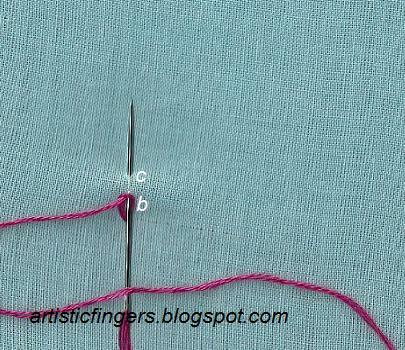 Step 3 - Take the thread from left to right and keep the thread under the needle as shown. 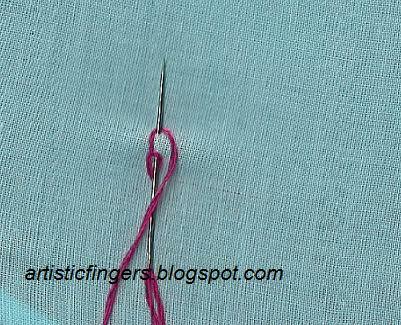 Step 4 - Pull the needle and thread. 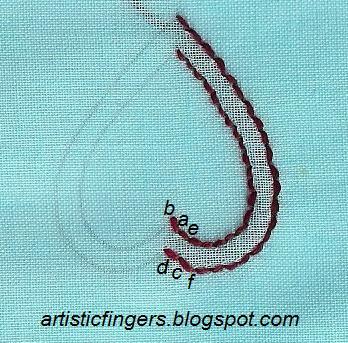 Step 5- Go back down at ‘b’ which is inside the loop of the 1st chain and come up at ‘c’. Notice that the needle is again on the right side of the thread at ‘b’. 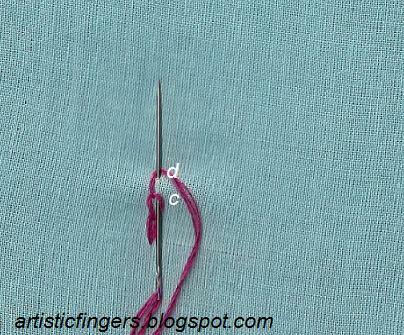 Step 6 - Take the thread from left to right and keep the thread under the needle. 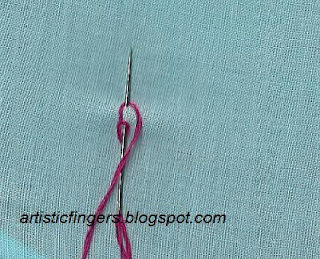 Step 7– Pull the needle and thread. 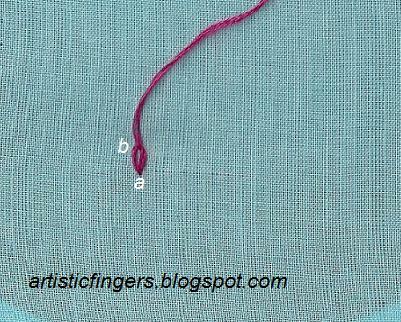 Step 8 – Go back down at ‘c’ which is inside the loop and come up at ‘d’. 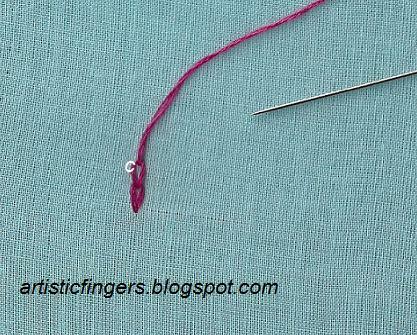 Take the thread from left to right and keep it under the needle .Pull the needle and thread. 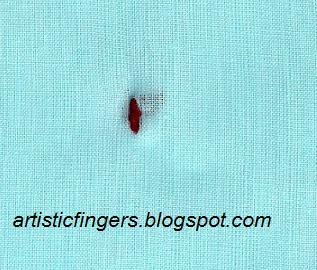 Continue in this manner and complete the design. 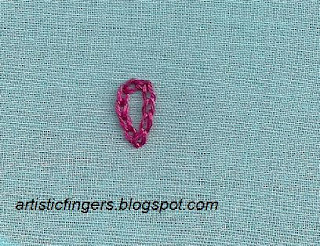 To end this stitch just go back down outside the last chain made. NOTE: If you are not comfortable with keeping the thread to your left in chain stitch,then change it to right in all the steps. Let me know if this lesson is clear.If it's not then please let me know where to add more info. 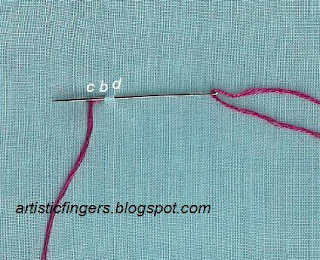 How to start and end the thread ?